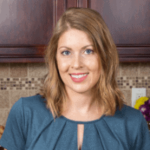 Published: May 26, 2016 · Modified: Apr 12, 2019 · By Jen Sobjack · This post may contain affiliate links. If you are crazy for pineapple and coconut, then this triple layer Pineapple Coconut Cake is for you! 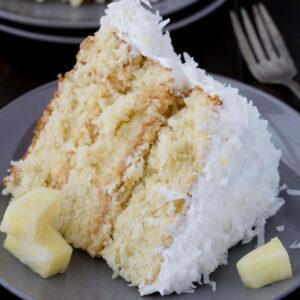 Three layers of homemade moist, fluffy coconut cake separated by rich and sweet pineapple curd and frosted with light and airy 7-minute frosting. The entire cake is covered in shredded sweetened coconut making it stunning enough for any special occasion. Another recipe featuring that glorious pineapple curd. I can’t stop. I won’t stop. Okay, maybe I will after this cake. I don’t think I can top it! Everyone in all of Internet land shared their version of coconut cake right around Easter. I wanted to make one too but decided to wait until the “trend” died down a little. Long after Easter had come and gone. This cake is so light and airy. Full of coconut. And, just might be my favorite coconut cake ever. The layers are infused with coconut extract and there’s shredded sweetened coconut in each bite. There is no lacking in coconut flavor. There’s a generous amount of homemade pineapple curd in between each layer of cake. Have you made this curd yet? It’s seriously so incredibly good. I’m adding it to my pancakes and waffles next. Thanks to a lovely reader for giving me that idea! Pineapple and coconut mesh so well together. This cake is like tropical heaven exploded in your mouth! I frosted the cake with the marshmallowy 7-minute frosting I shared a couple weeks ago. It’s so light and silky, I knew it would be perfect for today’s cake. Use coconut extract instead of vanilla in the frosting if you want more coconut flavor. Finish the cake off by pressing shredded coconut into the frosting. I like to set squares of parchment paper under the cake layers when assembling the cake on the cake stand. This keeps the stand clean and neat, which is very helpful when pressing coconut into the sides of the cake. All the excess coconut will land on the parchment paper. Gently pull the parchment paper out from under the cake when you are done and all the mess goes with it. Make the pineapple curd according to the recipe instructions. Preheat the oven to 325°F. Grease and lightly flour 3 9-inch round cake pans; set aside. In a large bowl, beat the sugar, butter, and oil together until light and fluffy, about 5 minutes. Add the egg yolks, one at a time, mixing well after each addition. Beat in the extracts. Combine the flour, baking powder, baking soda, and salt in a medium bowl. Stir with a whisk and add it to the butter mixture alternately with buttermilk, beating well after each addition. Fold in the coconut. In a large bowl, add the egg whites and cream of tartar. Use clean beaters and beat on medium speed until stiff peaks form. Fold 1/4 of the egg whites into the batter until well incorporated. Gently fold the remaining egg whites into the batter until no streaks remain. Divide the batter even between the prepared pans. Bake for 25-30 minutes or until a toothpick inserted into the center comes out clean. Cool for 10 minutes. Remove from pans and cool completely on a wire rack. Place one of the cake layers on a serving plate, bottom side up. Spread half the pineapple curd over the top, leaving a 1/2-inch margin around the edge. Top with another cake layer. Repeat with remaining curd and top with the third cake layer. Make the 7 minute frosting according to the recipe instructions. Spread the frosting over the top and sides of the cake. Gently press the shredded coconut into the frosting on top and sides of cake.